In 1957 Forest Evashevski’s book Scoring Power with the Wing-T became a bible for wing-t coaches. As I was flipping through the pages, two things got my attention. The first was in the text where Evashevski points out that the quarterback in the wing-t offense is really no different than the spinner fullback in the single wing offense. I think back to spring of 2012 when I told our quarterbacks that I was going to turn them into spinner backs with our new reverse-out footwork from the pistol. This was an effective change for us in creating misdirection and helping our play action, and was the basis for Evashevski’s backfield action. Many of these coaching points are very similar to the coaching points used in our boot/naked package. 1. 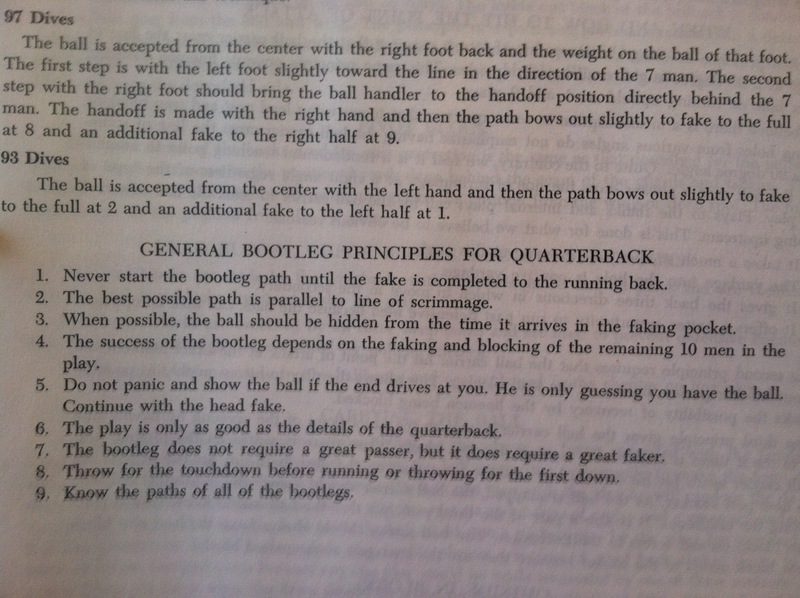 Never start the bootleg path until the fake is complete to the running back. We require our quarterbacks to carry their fake two steps vertically with their head and hands snapped to the running back. 2. The best possible path is parallel to the line of scrimmage. Once the quarterback is two steps vertically, he can snap his head and shoulders out of the fake and attack the edge. 3. When possible, the ball should be hidden from the time it arrives in the faking pocket. 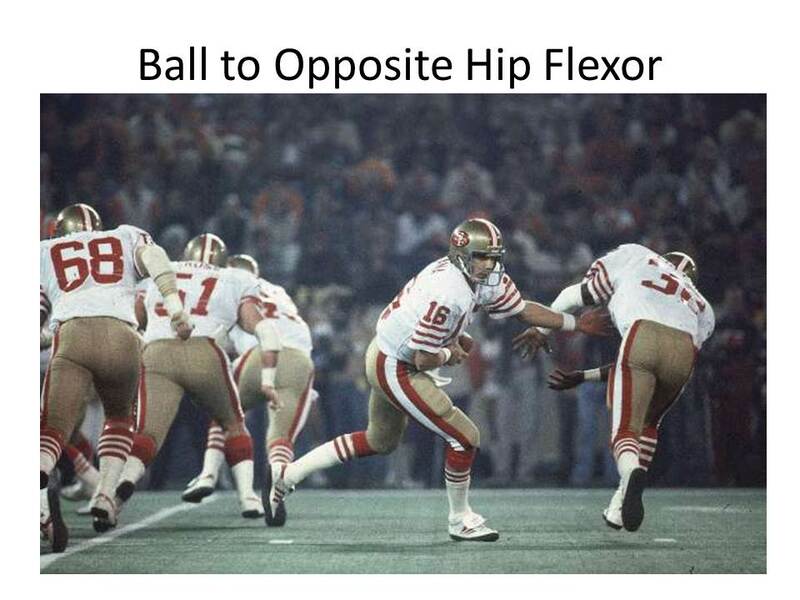 Our quarterbacks are taught to put the ball on the opposite hip flexor to keep it completely hidden from the defense. 4. The success of the bootleg depends on the faking and blocking of the remaining 10 men in the play. 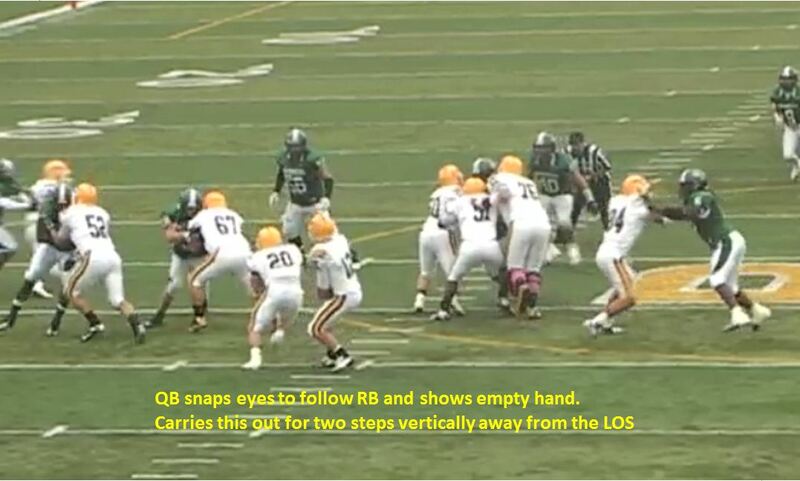 Our coaching point here is that we tell the O-Line to fully block the run, but don’t get caught down field illegally. The wham or pin block by the H-back adds to the run keys for the defense. 5. Do not panic and show the ball if the end drives at you. He is only guessing you have the ball. Continue with head fake. We make this a point with our quarterbacks. They must stay on their naked course. Most of the time we have someone at least brushing that end to make him think run. 6. The play is only good as the details of the quarterback. We constantly reinforce this coaching point. We want to see the run and the pass look exactly the same as far as quarterback mechanics and tempo. 7. The bootleg does not require a great passer, but it does require a great faker. Because the reads become very clean, this type of passing attack does not require a quarterback who has a huge arm. An athlete can be effective in the boot/naked package if he is consistent in his run fakes and naked mechanics. 8. Throw for the touchdown before running or throwing for the first down. This is a principal we believe in and build into the quarterbacks progression. His first look is the one that can hit big, like in the example below. 9. Know the paths of all of the bootlegs. We run naked off of all our runs and the quarterback must make each run look like the corresponding naked. The game is constantly evolving, but many things remain the same. In 2011 we became more multiple in our use of tight ends, h-backs and fullbacks, as well as with the compressed formations we used them in. Up to that point, the majority of our passing game revolved around our four vertical package, which we still liked from compressed sets, but we needed an attack that also allowed us to attack short to intermediate areas. Part of our philosophy is to be a concept based offense with our run and pass concepts having application over multiple personnel groupings and formations. In our search for a concept that could fulfill our requirements, spacing fit our needs. We took the spacing concept and designed our teaching of it to be a full passing attack that has the ability to adjust and attack multiple coverages. Another benefit is that the initial stem of the routes used in spacing looks like the stems of the routes in some of our four vertical variations. Defenders who are used to having to run with seams now have routes snapping down underneath them. In order for the concept to be multiple, we designed the package in a way that simple tags could give it multiple personalities. In its basic form, it creates a horizontal stretch with five receivers across the defense at 6-10 yards. Structurally, we call the play “Spacing” and we tag the receiver and the route which the quarterback can hit on rhythm on the last step of his drop. His progression will begin with the tagged rhythm route to the other routes within the concept...read more. The option play has gained a resurgence in football with the popularity of the spread offense. Relying heavily on the run, option football forces a defense to be disciplined and play their responsibilities. It’s still a very sound way to attack defenses, but requires a commitment to running those base plays over and over. The spread has allowed teams that attack with option and to carry an effective passing attack that utilizes the spread to get the ball to players in space. The zone read and bubble have become a staple for spread option teams as well…more here. One word play calls have become a hot topic lately. With this mode of play calling the word gives the personnel, formation and motion and the play. It’s been equated to going into a fast food restaurant and ordering a “number six” which includes your sandwich, fries, and drink. My initial though was that it certainly limits flexibility, but in my mind these should be used on a limited basis having somewhere between one and eight plays that would be used with this method. Like the fast food restaurant, you can still order everything else on the menu, but giving the single number quickly moves you along. As I reflected back, I realized I used this in 2006 prior to using no huddle. We had a call “Bazooka” which was the personnel, formation, shift and motion, and the play. Eventually this evolved to a three play package. An example of this is below. We run a sequence of shifts before snapping the ball, but all that was called from the sideline was “Bazooka” which told the personnel on the sideline to go in and gave the QB the huddle call. I have used Bazooka in no huddle as well. In this version we run a Power after a sequence of shifts and a motion. We had no problem running this because the players think it’s fun. More on this topic later…. I spoke at the Glazier Clinic in Cleveland in March 2007. This is my update to my stretch presentation, Inside Zone presentation, and a new presentation on Techniques for Zone and Stretch. Download my clicking on each below. Check out this video highlighting our new football facility! The article “Avoid a Quarterback Controversy – An Objective System for Grading Your quarterbacks” in the February issue of American Football Monthly explained the criteria we first used for evaluating and determining our starting quarterback for the 2010 season. This post will illustrate some of that criteria that we use in determining our starter and constantly evaluating the performance of our quarterbacks. As stated in the article, this is not only a system for the quarterbacks, but the data is also useful in determining what our quarterbacks are best at and what may need more work in practice. The data tells me as their coach what we need to work on more in practice in both terms of individual technique and overall execution of scheme…more here.